Some people need to start their day with a cup of coffee. Their eyes don’t open fully, their senses don’t kick into gear and their brains don’t function without it. I like coffee. Hot, black and strong. But I don’t need for it to perk me up. I don’t need for it to start my day. I don’t require it. I just like it when I drink it, whenever that might be (usually after a good meal). So, here we all are. It’s morning. We’ve all gathered. Am I required to drink coffee simply because some others around me need it? Maybe I’ll join them in a cup, just to be sociable. Or because it’s made, and the aroma beckons to me. Or maybe I’ll have a nice cuppa tea. Or maybe nothing at all. We are all in the same place, in basically the same situation. Does that mean we are all forced to do the same thing, whether we need or want it or not? I’d never deprive the morning coffee addict of her morning cup of joe just to make her conform to my lifestyle requirements. Nor, I suspect, would she force hot coffee down my throat simply because she craves it. I sometimes view improv warm-ups that way. I’ve said it. Sorry, I just do. Not everyone always needs to run through Bunny Bunny, Zip-Zap-Zop, Hotspot or Electric Company before every rehearsal or show. Maybe we’ve had an active day and are already quite warmed up and would really appreciate a little personal Zen-time. A moment for quiet reflection. An earbud full of Mozart or Adele. Maybe we are going to do some grounded, patient scene work that night, and jumping around in the improv equivalent of a bounce house would get the wrong hormones flowing in the wrong directions. Do we all need to get on the same page before every show? Sometimes, might it work well if I’m me and you’re you, and we discover the same page in our scenes? Sometimes? 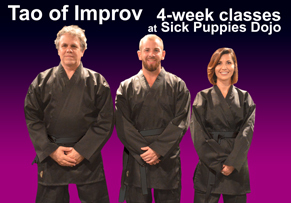 Sure, most times, improv warm-ups are a fun way to get the blood flowing, to get silly and energetic and to cauterize the sensible portions of your brain. But every once in awhile, there are improvisers (and I fear I’m one of them) who don’t want to join the drum circle. Sometimes, it’s a great idea for cast members to sit back and open up a nice, frosty can of Shut-The-Hell-Up Juice, and drink it right down. Sometimes, your need is the group’s need. Sometimes, a group really is made up of individuals, and those individuals are different. Does your troupe celebrate difference? Or does it force uniformity? If you haven’t thought about it, maybe you like uniformity in your life. If you have thought about it, Shut-The-Hell-Up Juice comes in cases. Bring a case sometime and share.